Figure above shows an electrolytic cell. 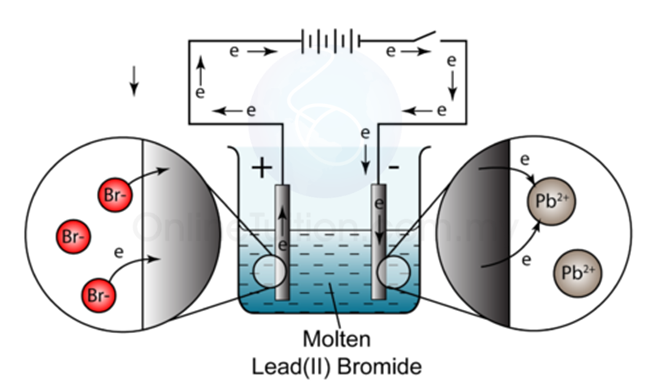 The electrode connected to the positive terminal of the cell is positive electrode and is given a name, anode. 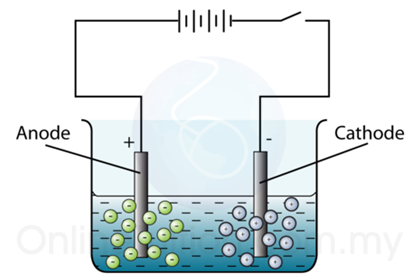 The electrode connected to the negative terminal of the cell is negative electrode and is called the cathode. Electrolysis is a process where a compound is separated into its constituent elements when electric current passes through an electrolyte. All electrolytes are ionic, which means they are composed of positively and negatively charged ions. On passing an electric current through the electrolyte, these ions move towards the oppositely charged electrode. During electrolysis, negatively charged ions move towards the positive electrode(anode). The negative ions lose their electron(s) to the anode, which is positively charged. The electron(s) is then move to the cathode through the external circuit (the wire). The positively charged ions move towards the negative electrode(cathode). At cathode, positive ions gain electron(s) from the cathode, which has an excess of electrons and therefore an overall negative charge. This process results in the chemical decomposition of the electrolyte. It also allows electrons to travel from the cathode to the anode and hence allows conduction of electricity. During the electrolysis, electrical energy is supplied to the system to produce a chemical reaction. Therefore, during electrolysis, electrical energy is converted into chemical energy. 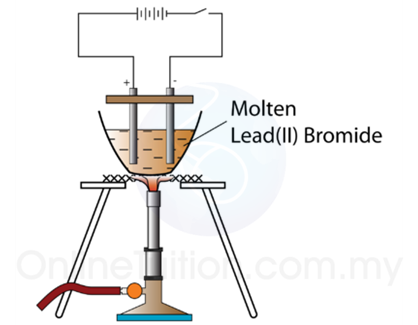 Figure above shows the apparatus set up for electrolysis of molten lead (II) bromide. The electrolysis process start when lean (II) bromide start melting. When electricity is flowing, brown fumes of bromine gas are seen at the anode. each bromine ion loses an electron to form a bromine atom. two of these newly formed atoms combine to form a bromine molecule (bromine gas). each ion gains two electrons to form a lead atom.